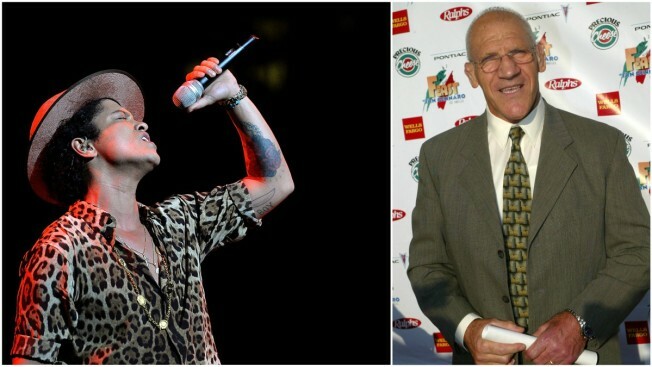 Bruno Mars sent his condolences to the family of WWE legend Bruno Sammartino, the man who is the inspiration for his stage name, via Twitter Thursday morning. “Sending love and prayers to Bruno Sammartino’s family. He was such a gentleman when I met him & really meant a lot to my father & I. RIP,” the tweet said. Sammartino died Wednesday at the age of 82, according to WWE. The “Italian Superman” held numerous titles and was the WWE’s longest-reigning world champion which ESPN says he held for nearly eight consecutive years. Mars was born Peter Gene Hernandez, but was nicknamed “Bruno” by his father because he was a huge fan of the wrestler. His dad said the inspiration for the nickname was because Mars was a “chunky” baby — and Sammartino was about 275 pounds at his prime wrestling weight. The two Brunos met last August during a "24K Magic World Tour" pit-stop in Pittsburgh and the “Finesse” singer shared a photo on Instagram. Mars’ fans have been sending their support to the singer via Twitter as well.